Help alert us to safety issues on our City streets. 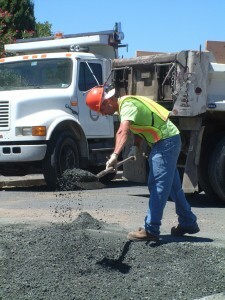 The Building & Public Works Department is committed to keeping the City's streets in good working order. Potholes often appear during rainy weather. While minor repairs can be accomplished relatively quickly, major repairs or reconstructions may have to be scheduled. Please help by reporting any potholes or other street issues by completing this form 24 hours a day or calling 707-421-7349. Please provide as much information as possible. Photo of pothole or primary issue. To be contacted by City employees regarding this street issue, the progress of repairs or additional information, please complete the following section. We will require at least your name and a functioning email address so we can provide feedback regarding your inquiry. Please note: The inability to locate a specific issue due to insufficient information may impact the speed with which repairs can be made.